Now available to all Verizon Business and Enterprise customers for $249.99 alongside a two-year contract, or if you want to pick it up as a standalone handset, it will cost $599.99 apiece at the end of this month. Specially designed with durability in mind, the Cat S48c will arrive with heavy-duty rugged credentials such as IP68 water and dust proof, MIL SPEC 810G and Non-incendive Class I, Division 2 in order to ensure that it is more than capable of withstanding drops, dust, vibration, extreme temperatures and some hazardous work environments. Feel free to submerge in up to four feet of water for up to 35 minutes and it will still continue to function without missing a beat, while its 13MP camera is capable of snapping memories while underwater, on site, when you are outdoors, or even during your vacation and downtime. There is a powerful 4,000mAh battery underneath the hood that is capable of providing up to 30 hours 3G talk time, making it more than perfect for those times when you need to be out somewhere without a power outlet in sight. 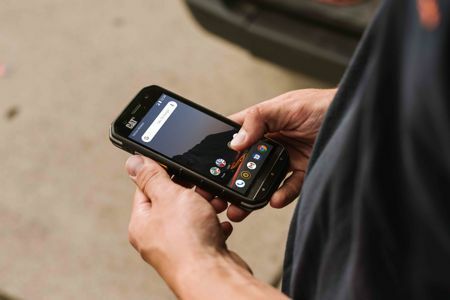 The presence of a dedicated, programmable key enables easy push-to-talk capabilities or instant access to the camera, flashlight or a preferred app. Other hardware specifications include a 5″ Full HD display with Corning Gorilla Glass 5, Android Oreo, 64GB of internal memory and 4GB of RAM, a microSD memory card slot, all powered by a Qualcomm SDM630 chipset.